These petite howlite skull beads are perfect for Halloween but can work any time of the year thanks to the sophesticated shoulder duster styling and crystal dangles. And the best part is that they only require basic wire wrap skills and tools. Their casual style doesn't require obsessive attention to detail so they are perfect for a less experienced wire wrapper. These finished earrings are over 4 inches long, but yours don't have to be that long. Wrap only three skulls for a shorter pair or one if you prefer a more dainty dangle. For whatever reason, drop earrings tend to feel more balanced with an odd number of beads - but don't take my word for it. Try it out for yourself and see what feels right to you. For more spooky projects, check out this list of free Halloween inspired beadwork and jewelry making projects. 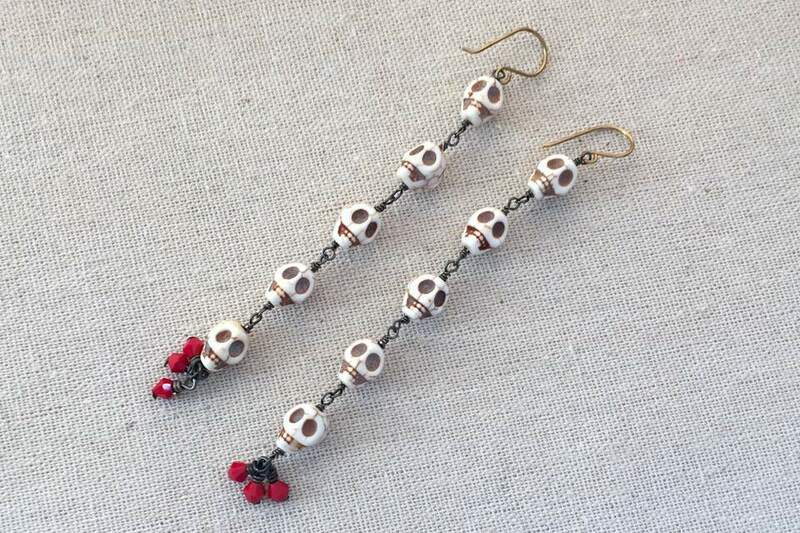 To make these earrings, you will need one strand of howlite skull beads. They are available in a variety of bright dyed colors and also two sizes. The skulls used for this project are the smaller size. In addition to the beads, you will need a pair of earwires, 22g or 24g craft wire and basic wire working tools including round nose pliers, two pairs of flat nose or chain nose pliers and flush cutters. Parawire is a good brand of craft wire that is available in a wide variet of sizes and color finishes. If you plan to add dangles to the bottom of the earrings, you will also need crystal beads and headpins. This project uses a basic wire wrapping technique called a wire wrapped loop. It is a more secure version of a simple wire loop, since the loop is wrapped close and cannot come apart. If you are more familiar with making simple wire loops, you can substitute that technique but will need a thicker wire, probably 20g. In order to make a wrapped loop, you will need two pairs of pliers - one to hold the loop and another to wrap the tail around the step under the loop. A basic set of wire wrapping pliers will typically have pointy nose pliers, flat nose pliers, flush cutters and round nose pliers similar to those seen in the picture. Wire tools are available in all price ranges and you should buy the ones that appropriate for your level of interest, experience and budget. The Lindstrom RX Pliers set shown is one of the more expensive ones, but ergonomically designed to avoid hand strain and are more comfortable to use than craft pliers. One of the quickest ways to make a chain of wire wrapped beads is to do it assembly line style. That means you can cut all of the wires to size at the same time, make the first loop for the wrap at the same time, then connect and wrap them together. Making wire wrapped bead chain the fast way saves you time from having to pick up and change tools as often. Start by cutting a piece of wire about 2 inches long. I find that I need around 3/4 inch of wire for each loop and the amount of wire for the bead. Make a wrapped loop following the instructions on the next several slides. The wrapped loop is demonstrated on the second loop, but the process is the same regardless. Make a right angle bend in the wire using your round nose pliers - in this case right above the top of the bead. When there is no bead on the wire, you wire make the bend approximately 3/4 inch away from the end of the wire. Bend the wire over the top of the round nose pliers until you have 3/4 of a loop. At this point, you will remove your pliers and switch from the top round barrel to the bottom one so you can continue to wrap the wire around. Wrap until your wire crossed at a right angle. This will put you in position to wrap the tail around the wire stem. Grasp the loop using one pair of flat nose pliers and grasp the tail with the other. Wrap the wire tail around the stem, at least once or twice to secure it in place. This can be as neat or messy as you like. For casual earrings like these, I try to make it a little more casual and messy. Try to wrap the tail wire tight enough that the bead will no longer spin on the wire. This is a personal preference, but I like to try and have all of my skull beads facing forward and the only way to do that is if they won't spin freely on the wire. When secure, trim the wire tail close to the bead with the flush cutters. Follow the same process for each skull bead BUT be sure to insert the open loop (before you've wrapped the tail) into the closed loop of the prior component in order to link the skull components together. If you forgot, it gets much harder and you may need to cut some loops off and try again. Once you have two lengths of skull beads the appropriate length, it is time to add the dangles and earwires. Add a crystal bead to each headpin. Make a loop but don't wrap it closed yet. Slip the loop on the loop at the last skull and then wrap the loop closed. If you have trouble threading all of the dangles on the loop under the skull bead, another alternative is to just wrap the loops closed and then twist open a jump ring, put the dangles on the jump ring and connect it to the bottom of the skull. Open the loop of the earwire by sliding it open to the side. Add the loop on the first skull to the earwire and twist the loop closed again. Always open jump rings and loops by twisting them open to the side instead of pulling the ends apart. Enjoy your boo-tifully scary and fashionable earrings!